All Nationalist Party MPs bar one were on Wednesday tight-lipped when asked to publicly declare if embattled leader Adrian Delia still enjoyed their trust in the wake of allegations levelled at him. 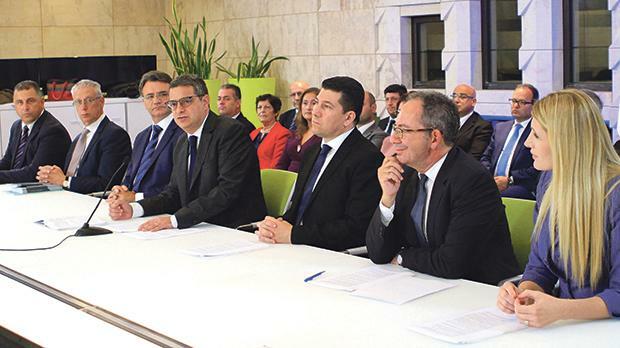 This wall of silence was put up despite constant leaks within the parliamentary group about what some elements within are describing as the “PN’s winter of discontent”. None of the MPs who had previously confided to Times of Malta their lack of confidence in Dr Delia were ready to go on the record when approached on Wednesday. The party said last night the administrative council, which includes some MPs, unanimously expressed confidence in Dr Delia. The PN leader has been facing calls to resign for a number of weeks following allegations of domestic violence, money laundering investigations and issues related to his personal finances. So far, the only pronouncements made on the matter were by PN executive committee president Mark Anthony Sammut and MEP candidate Michael Briguglio who called for an internal debate within the party structures. No date has been set yet for the next parliamentary group meeting amid internal criticism that Dr Delia was trying to avoid confronting his own MPs in an attempt to quell a “rebellion”. Times of Malta was told last week a petition was being circulated among Nationalist MPs to secure enough signatures to force Dr Delia to step down. However, the momentum behind the move appears to have faded because nothing of the sort materialised so far. This fuelled comments that Dr Delia’s critics had opted to sit on the fence rather than stand up and be counted. It was against this background that Times of Malta on Wednesday asked each Nationalist MP, its three MEPs and the two Democratic Party MPs whether they had confidence in Dr Delia as Opposition leader. The only clear response received by the time of writing was from Mario Galea who expressed his full support to Dr Delia. The majority did not reply at all. Former Opposition leader Simon Busuttil replied with a “no comment” as did Stephen Spiteri, who said such an issue had to be discussed at party level. Marlene Farrugia and Godfrey Farrugia were the only Opposition MPs who said they had no confidence in Dr Delia. Ironically, they were elected on the PN ticket under the defunct Forza Nazzjonali coalition agreement. “I did not have confidence in him from the day he called Daphne [Caruana Galizia] a biċċa blogger. That comment already showed contempt for free expression,” Marlene Farrugia said. Democratic Party leader Godfrey Farrugia pointed out he had declared losing trust in Dr Delia prior to the domestic violence allegations that had surfaced around Christmas. The party’s administrative council on Wednesday unanimously expressed confidence in Dr Delia, expressing its support and condemning “the coordinated and malicious attacks” against him and the party, the PN said last night. Dr Delia said on his way to the meeting earlier he believed he still enjoyed the council’s support, adding he had not been told anything that could indicate otherwise. The PN deputy leader for party affairs, Robert Arrigo, said the allegations about Dr Delia were not on the agenda. MP Kristy Debono said she believed Dr Delia did have the committee’s support. She said the matter was “definitely” not on the agenda though it could be raised by a committee member.